Lieutenant Colonel Mark S. Carroll retired from active duty after 24 years of service in the Army Medical Service Corps. His previous military assignments included Chief of Operations, Tricare Mid-Atlantic Region; Comptroller, Womack Army Medical Center, Fort Bragg, North Carolina; Executive Officer, Joint Task Bravo Hospital, Honduras; Operations Officer, U.S. Army Cadet Command, Fort Monroe, Virginia; Traninin Officer, Health Services Command and Chief Training Officer and Instructor, Armed Forces Combat Casualty Care Course, San Antonio, Texas; Chief Operations Officer, and Intelligence Officer, 30th Medical Group, Germany; Commander, Hospital Company, Raymond W. Bliss Army Hospital, Fort Huachuca, Arizona; Medical Platoon Leader and Air Operations Officer, 2/502nd Infantry, 101st Airborne Division, Fort Campbell, Kentucky. Colonel Carroll's awards include the Defense Meritorious Service Medal, Meritortious Service Medal (7th), Army Commendation Medal (2nd), Army Achievement Medal, and National Defense Service Medal (2nd). Air Assault Badge, Expert Field Medical Badge, Expert Marksmanship Badge, and Physical Fitness Badge. Colonel Carroll is a native of Kentucky and was born in Lexington. He attended the University of Kentucky and was commissioned in 1972 through the UK ROTC Wildcat Battalion where he was a member of the UK Ranger Company (Long Rifles). 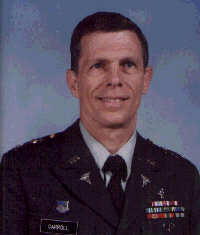 After entering the Army, he continued his education and was awarded masters degrees from the University of Northern Colorado in Public Administration; and Syracuse University in Business Administration and Army Comptroller Course where he was inducted into the Beta Gamma Sigma Honor Society, and was graduated from the Army Command and General Staff College.